Houston is a huge city with several district articles containing sightseeing, restaurant, nightlife and accommodation listings — have a look at each of them. Houston is the largest city in Texas and the fourth largest in the United States. Apart from its population, it is also huge in terms of square miles. 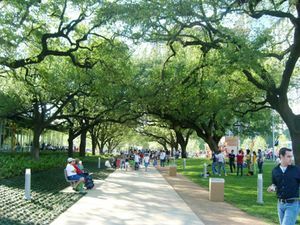 While urban sprawl is synonymous with Houston, the districts closest to Downtown offer visitors a vast array of choices in a relatively small area. Houston is multicultural and diverse, home to some of the nation's largest Latino, African American and Asian American populations. 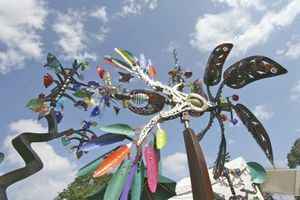 It boasts an eclectic museum and arts scene, vibrant shopping, and has become a burgeoning destination for food lovers. Center of the city, still the home of high finance and big business. Houston is second only to New York City in corporate headquarters of Fortune 500 companies. Many of them are located downtown including some of the world's largest energy companies. Downtown Houston also boasts the third largest theater district in the United States and the city has world class permanent organizations such as the Houston Symphony, Alley Theatre, Theatre Under the Stars and Houston Ballet. The Houston Pavilions entertainment district opened in October 2008 between Main St. and the Toyota Center. Ideally bordered by Midtown, Heights, River Oaks, and the Medical Center. Montrose is Houston's longtime home of its LGBT population. Lower Westheimer (Westheimer in between Montrose Blvd. and Shepherd) offers an array of resale fashion shops, eclectic shopping as well as antique stores. The gay nightlife is centered around Pacific St. and surrounding streets. Many Montrose neighborhood pubs attract an eclectic and diverse crowd. A large district of gingerbread Victorian homes as well as early 20th Century bungalows. Like its sister neighborhood Montrose, The Heights is home to a diverse population from artists and musicians to wealthy professionals. Parts of the Heights are still dry, fostering a large number of BYOB restaurants ideal for those who enjoy their own selected wine. To the south and east of downtown lie Rice University, the many attractions of Hermann Park, Reliant Stadium, and the Texas Medical Center (or just "the med center"), including some of the world's best hospitals. The Rice Village is a highly concentrated area of restaurants, bars, and shopping. Uptown or The Galleria Area is known for its namesake, a huge high-end shopping mall complex and has the tallest building in the United States outside of a main downtown area, the Williams tower. Nearby River Oaks is home to Houston's most exclusive and affluent neighborhoods and businesses, home to eye-popping mansions and the River Oaks Shopping Center, one of America's first suburban shopping districts and a great display of Art Deco architecture. This area has many great restaurants, vibrant nightlife, and infamous traffic jams during peak hours. Off-the-beaten-track, these areas have plenty to offer for the patient traveler including NASA/Space Center Houston, nature centers and interesting day trips. Houston is the largest city in the United States without any appreciable zoning. While there is some small measure of zoning in the form of ordinances, deed restrictions, and land use regulations, real estate development in Houston is only constrained by the will and the pocketbook of real estate developers. Traditionally, Houston politics and law are strongly influenced by real estate developers; at times, the majority of city council seats have been held by developers. The city is primarily built on the oil industry. What this means to the visitors is that, although the city has several good cultural and tourist destinations due to its population, there aren't as many as expected for a city of over 2 million people. Houston's large population comes partly from the fact that it encompasses a whopping 600 square miles of land area, much larger in land area than New York City (300 square miles), Los Angeles (460 square miles), and Chicago (225 square miles) -the nation's three most populous cities- yet Houston has less population. Another noticeable fact, unlike most major cities around the country, Houston suburbs tend to be very far from the city center and would be considered separate cities in many jurisdictions. This is because the city government tends to annex any substanial population centers that grow near it, evident in Houston's land area of 600 square miles. Such a spread out low-density city means a car is essential for getting around the area efficiently. However, Houston's concentration of attractions lay, more specifically, in between downtown and the Galleria. The Greater Houston Convention and Visitors Bureau operates the Houston Visitors Center,. The center is located in the heart of downtown Houston at 901 Bagby (corner of Bagby and Walker St.), on the first floor of the historic City Hall. Find information on Houston's history, attractions, restaurants, hotels, directions, maps, purchase Houston merchandise and watch an 11-minute film on Houston. You'll find over 10,000 brochures and magazines to help plan your visit to the Houston area. The center is open Monday - Saturday, 9 a.m. to 4 p.m.
Houston's climate generally ranges from a very hot summer to a mild winter. Humidity is high in the summer months and makes temperatures feel extremely hot. The city also has a fairly large amount of rainy and cloudy days throughout the year. The months of October to April make for the best time to visit in order to avoid the heat. Houston is served by two major commercial airports and two smaller regional airports. George Bush Intercontinental Airport, (IATA: IAH) . The larger of the two airports and is located 23 miles north of downtown near Beltway 8, between IH-45 North and US-59 North. It is the largest hub for United Airlines and serves 25 domestic and international airlines. William P. Hobby Airport, (IATA: HOU) . Located 7 miles south of downtown and is located off of I-45 South. It is convenient if you're travelling downtown or south of the city, such as to Galveston. Its main carrier is Southwest Airlines, and it also served by Delta Airlines, American Airlines, and JetBlue. Houston is the fourth largest city in the United States covers an area almost twice as large as its three closest competitors. Home to more Fortune 500 companies than any other city in America, Houston is a major hub for private and business aviation. Sugar Land Regional Airport, (IATA: SGR) . Located 25 miles southwest of downtown on TX 6, just north of U.S. 59. It is a popular choice among the well-heeled corporate aircraft set. Air taxi and air charter companies such as Monarch Air Group , Mercury Jets  fly a variety of private charter aircraft and jets, from charter luxury Gulfstream's down to economical piston twins for small groups and individuals. Ellington Field, (IATA: EFD) . Located 19 miles southeast of downtown, just off I-45. Formerly an air force base, now used for general aviation, non-passenger commercial traffic, and government aviation (NASA, Texas Air National Guard, U.S. Coast Guard). Conroe-North Houston Regional Airport (IATA: CXO) in Conroe, TX . Formerly Lone Star Executive and Montgomery County. Pearland Regional Airport (IATA: LVJ) in Pearland, TX . Formerly known as Clover Field. Generally speaking given the sprawled out nature of Houston and the lack of public transit, most visitors to Houston rent a car as soon as they arrive at the airport. Regarding public transit at either George Bush Intercontinental Airport or Hobby Airport you basically are stuck with using either a shuttle service, taxis, or the public bus service. To get from George Bush Intercontinental Airport using the local bus system, Metro Bus 102  picks up on the south side of Terminal C street level (baggage claim outside door C-105) and goes directly into Downtown (with a travel time of approximately one hour). To get from Hobby Airport to Downtown Houston take Metro Bus 40  which stops at Curbzone 13 outside of the baggage claim area in the lower level (which also has a travel time of approximately one hour). If you are heading directly from either airport to a cruise ship many companies will also run shuttles directly from either airport to the cruise ship terminals in Galveston or Bayport. Amtrak, 902 Washington Ave, . Amtrak's Sunset Limited line is the only passenger train route with a stop in Houston, although a daily bus provides a direct connection from the Houston Amtrak station to the Texas Eagle at Longview. BW-8 ("The Beltway/Sam Houston Tollway"): Loop about twice as far out as IH-610. SH-99 ("Grand Parkway"): Outermost loop under construction. Currently open on the west and north sides of the city and another section near Baytown. Downtown station, 2121 Main St.
Crosstimbers Station, 4001 North Freeway. Northwest, 1500 West Loop North. Megabus, . Runs buses from Houston to Dallas, Austin, San Antonio, and New Orleans. Departs from three different locations in Houston. Vonlane, . Runs first class buses from Houston to both Austin and Dallas equipped with various amenities such as leather seats, ample leg room, free Wi-Fi, and satellite TV. Bush Intercontinental Airport, 6655 Will Clayton Pkwy. Autobus Americanos, . Mexican trans-border bus line with services to various points in Mexico. Operated by Greyhound in the U.S. and Grupo Estrella Blanaca  in Mexico. Starline,  . Express city to city bus service with routes direct to College Station. Downtown, 815 Pierce St (north of Travis St). They also have additional stops at Door 5 of Katy Mills Mall (by Sun & Ski Sports) @ 5000 Katy Mills Circle, Katy; and a Select Shell Station/Store @ 13250 FM 1960 W (FM 1960 & US Hwy 290W). Please look at the ticket as to which stop you need to go to before heading out. The same bus may not stop at all three stops. El Expreso, . Goes south to Brownsville/Matamoros; Monterrey via Laredo/Nuevo Laredo; & McAllen/Hidalgo. Goes north to Chicago via Luftkin, Texarkana, Little Rock & Memphis on one route and direct to Dallas on another. Goes east to Mobile. One route goes north from Mobile up to Raleigh via Atlanta, Gainsville, Greenville & Charlotte while the other goes towards Florida. Downtown station, 2201 Main St.
Turimex Internacional, . Mexican trans-border bus line with services to various points in northern Mexico and the US states of Texas, Illinois, Tennessee, Georgia, North & South Carolina, and Mississippi. Omnibus Mexicanos, . Mexican trans-border bus line with services to various points in Mexico. Third Ward, 3200 Telephone Rd. You can get to Houston easily from Mexico (from as far as Mexico City and Michoacan) on a bus. In the bus stations of many major cities in Mexico you will see buses advertised to go to Houston. There are many private bus companies in Houston that exclusively serve Mexico. Houston has a number of freeways and tollways that make getting around the metro area by car fairly easy. The expressway system is arguably the second-most comprehensive in the nation, after that of Los Angeles (see list of freeways under the "Get in" section.) A number of obstacles, however, can make driving in Houston a less than pleasant experience. One is construction, which seems to be ever-present; and the other is traffic. Evening rush hour in Houston begins as early as 4PM and can last to 7PM. Morning rush hour is between 7AM and 9AM. During rush hour, traffic on the highways can come to a halt. The area near the Galleria, between US-59 and IH-10, is an area you should avoid during rush hour if possible. The HOV lanes are generally operational Monday - Friday. In the morning morning hours (5AM - 11AM) they run inbound, and in the afternoon and evening (from 2PM - 8PM), outbound. The HOV lanes are generally restricted to cars with 2 or more passengers, but the Northwest freeway's HOV lanes require 3 or more passengers during peak travel periods (6:45-8AM). The HOV lanes can be marked with signs bearing a white diamond on a black background, or, more recently, with signs bearing a green strip saying "Express lane" at the top. Highways with HOV lanes are: I-45 North, I-45 South, US-59 North, US-59 South, I-10 West (Katy Freeway), and US-290. Recently, The Katy Freeway HOV lanes have been expanded into the Katy Freeway Managed Lanes, a 24-hour multi-lane HOV with paid Single-Occupancy Vehicle access cost-adjusted based on HOV usage. In addition, METRO has announced a program to allow Single-Occupant Vehicles onto HOV lanes with the payment of a toll. More information about these new HOT Lanes can be found at the aptly-named ihatehoustontraffic.com. Note: The Sam Houston (except for the 13 mile Northeast section) and Hardy Tollways are the only toll-roads that allow cash payment of tolls at toll plazas. All other toll-roads, including managed lanes, require a pre-paid RFID "EZ Tag." Cash toll plazas accept coins from $0.05 up to $20 bills and do not accept credit or debit cards. The Metropolitan Transit Authority of Harris County, better known as METRO , operates local and express bus lines, as well as a very popular light rail system called METRORail . Visitors may be able to get around without a car, especially if they stick close to downtown, but ample free and cheap parking, combined with Houston's suburban sprawl, make public transit an unpopular choice for Houstonians themselves. Bus Reloaders at the back of every local bus. These are a bit counterintuitive to use, but once you get them, they're quite simple. Insert a bill, and then place your card in the slot. These machines take $1, $5, $10, and $20 bills, and will reload only one bill at a time. Places where cards can be bought: any store that sells Q Cards can also reload the card for you—just ask at the service desk! Most grocery chains and many convenience stores sell Q Cards. If you're brave enough to see Houston from the back seat of a bus, a Q Card is definitely worth the investment, as it's the only way to obtain transfers from one route to the other. Unlike other systems, which require you to transfer at a central point, or only give you a short amount of time to switch buses, METRO gives you unlimited, free transfers for a full three hours after boarding the first bus. No need to ask the driver for a transfer—just tap your Q Card like you would normally. The computer will make sure you pay the least amount possible. The following bus lines listed below are the ones that most visitors will probably find to be useful. Bus Route #2:  Runs east and west along Bellaire Blvd connecting the Texas Medical Center with the various ethnic neighborhoods along Bellaire Blvd in Southwest Houston with frequencies of every 15 minutes. Bus Route #27:  Runs north and south along Shepherd Ave. connecting the Houston Heights neighborhood with Montrose and Rice Village/Rice University and the Texas Medical Center and runs every 15 minutes. Bus Route #35:  Runs east and west along Richmond Blvd. connecting the Uptown/Galleria area with Montrose and Midtown and runs every 15 minutes. Bus Route #40:  Connects Houston-Hobby Airport with Downtown Houston and runs every 30 minutes generally. Bus Route #56:  Runs north ans South along Montrose Blvd. passing connecting the Texas Medical Center, Rice University/the Museum District, Montrose, and the Houston Heights neighborhoods with frequencies of every 15 minutes. Bus Route #82:  Runs east and west along Westheimer Rd. connecting the Uptown/Galleria area with Montrose and Midtown and runs every 15 minutes. Bus Route #85:  Runs east and west along Washington Ave. connecting Downtown Houston with the Washington Ave corridor and Memorial Park and runs every 15 minutes generally. Bus Route #102:  Connects Houston-Bush Intercontinental Airport with Downtown Houston and runs every 30 minutes. Outside of Downtown, don't expect to catch a taxi on the streets, but there are various cab stands located at various parts of downtown proper. Taxis in Houston are generally dispatched by various companies. Traveling via a limousine has become more popular lately. Many Houston limousine companies offer full ground transportation options such as town cars, classic cars, stretch limos and luxury vehicles that can be utilized for special occasions like airport transportation, parties, school dances, business functions and weddings. Houston is so spread out and (most of the time) humid and hot that bicycles are often best used for exercise or to get to somewhere that is closeby. On the other hand, if you have a little bit of stamina and perseverance, Downtown, Midtown, Rice, Uptown and the Medical Center/Hermann Park/Museum District area are within a 30 minute ride. Multi-modal transportation is also possible, since all city buses have easy to use racks in the front or storage compartments that can get traveler and bicycle near to a final destination. There is a bike sharing service that is available thru B-cycle. There are 29 docking stations located mainly around Downtown, Midtown, Montrose, and the Museum District. Rides of less than 60 minutes incur no fee, while there is a small fee for longer rides. The city of Houston has 290 miles of marked bike routes, plus another 80 miles of hike and bike trails in city parks, with concrete plans for even more expansion. For more information on the Houston Bikeway program, including a complete map of all marked bike paths, visit the City of Houston Bikeway Program website . Houston, like many large American cities, is diverse. As the state's largest city and the nation's fourth largest, Houston is home to more than 100 languages. Signs can be found in Spanish, Vietnamese and Chinese, among others, but English is the lingua franca for the majority of the population. Knowing some Spanish may help in certain neighborhoods, but most people will speak English. Travelers planning to visit multiple attractions may benefit from Houston CityPASS , which grants admission to 6 Houston attractions within 9 days of first use for a much reduced rate and includes expedited entry in some cases. The included attractions are: Space Center Houston; Downtown Aquarium; Houston Museum of Natural Science; Houston Zoo; Option Ticket One with choice of either Museum of Fine Arts or The Children's Museum of Houston and Option Ticket Two with choice of either George Ranch Historical Park or The Health Museum. The lively performing arts culture of Houston includes professional, community and university-based dance, opera, broadway musical, chamber and symphonic music groups, featuring both classical and pops programming. Theater is active in Houston and includes the Tony Award-winning Alley Theatre. Most professional theater is centered in the Theater District , but companies are located in many neartown neighborhoods and suburbs. Houston is home to Rice University, one of the most highly regarded private universities in the country. The wooded campus is noted for its beautiful architecture and public art, including James Turrell's "Twilight Ephiphany." Houston's largest public university is the University of Houston, home to the Blaffer Museum of Art. The campus of the University of St. Thomas is located near the Menil Collection and Rothko Chapel and was designed by Pritzker Award-winning architect Philip Johnson. The Campus of Texas Southern University is located in Southeast Houston. Baylor College of Medicine and the medical school of the University of Texas are located in the Medical Center. The Houston unemployment rate is below the national average. Among large metropolitan areas, job creation rates in Houston are among the highest in the nation. In addition because of the oil and gas industry, Houston has the second largest concentration of Fortune 500 companies in the US, second only to New York City. Healthcare is also a growing industry with the Texas Medical Center complex located within the city including 54 medicine-related institutions, including 21 hospitals and eight specialty institutions, eight academic and research institutions, four medical schools, six nursing schools, and schools of dentistry, public health, pharmacy, and other health-related practices. Many of the shopping malls are concentrated to the west of downtown in Uptown. In general, prices in Houston are lower than in other major US cities. A very popular place to go shopping in Houston is the Houston Galleria. The Galleria is the largest mall in Texas  and the ninth largest in the United States. In southwest Houston just beyond the Loop is where the Asian bazaar meets American suburb. This fascinating area is simultaneously adventure shopping and an exploration into the brave new world of postmodern America. First, drive down Harwin Drive between Fondren and Gessner and you will see store after store and strip mall after strip mall selling jewelry, designer clothes, sunglasses, perfumes, furniture, luggage, and handbags. Most stores are run by Indian, Pakistani, Chinese, and Thai shopkeepers, but other cultures are represented, too. Occasionally one will get raided for selling designer knockoffs. Everything is said to be at bargain-basement rates, but buyer beware. Farther out, on Bellaire Boulevard in the middle of a large commercial Chinatown, is an all-Chinese mall, where you can get just about anything Chinese, including tapes and CDs, books, food and cooking items, of course, and wonderful knickknacks. 19th Street in the Heights is a walkable shopping district with a small-town feel. It features several antique and retail clothing shops, a Mexican handi-craft store and a number of boutiques. Several restaurants and coffeeshops nearby make the area a good afternoon destination. The major supermarket chains in Houston are Kroger, Randall's (which is owned by Safeway), H-E-B, and Fiesta Mart. In addition the nation's largest discount store chain, Walmart, has several stores in Houston most of which are also open 24 hours and most Kroger stores in Houston are also open 24 hours as well. In addition many specialty and organic supermarkets such as Whole Foods Market, Central Market, Sprouts Farmers Market, and Trader Joe's can also be found throughout the area. Due to its huge expat and immigrant population, Houston also features a large variety of ethnic grocery stores, including Indian, Filipino, Pakistani, Chinese, Vietnamese, Japanese, and of course, Mexican. Houston is an international city, and one of the most diverse cities not only in the United States, but the world. The ethnic diversity of the city is well represented in the city's food scene. No matter what the ethnic type is, you name it, and Houston has it. For certain ethnic foods, there are ethnic neighborhoods to match the food type. For Chinese food, you can go to Chinatown, or even Old Chinatown which is located near Downtown. For Indian or Pakistani food, Houston's Little India (also known as the Mahatma Gandhi District) is the obvious place for that. For a Korean bite, Houston's Koreatown is located in Northwestern Houston. Vietnamese food has always has a strong presence in Houston, and the Western part of Chinatown is filled with different types of Vietnamese spots. Midtown is also known for Vietnamese food. Meyerland has been the heart of the Houston Jewish community, making Kosher food have its presence there. If you want an exotic Ethiopian or Nigerian treat, Bissonnet street in Southwestern Houston will be the place to go. Houston has outstanding dining options, and is widely considered the most restaurant-oriented city in the United States, with a thriving community of ethnic restaurants, superb Tex-Mex, classic Texas steakhouses and Gulf Coast seafood, as well as chain restaurants. Houston's fine dining scene has exploded in recent years, with Downtown, Montrose, Midtown, and the Heights (including the Washington Corridor) as the epicenter of what's hot-and-happening now. Although high-quality, authentic Mexican food can be found just about anywhere in the city (for some of the best surprises, stop by any nondescript taqueria and order nearly anything at random), the best ethnic dining is generally found in West Houston - in particular the area west of Highway 59 and south of I-10, with everything from Middle Eastern to Ethiopian to Bosnian. The bustling Mahatma Gandhi District around Hillcroft St. is the place to go for top-notch Indian and Pakistani cuisine. In years past, you'd go east of Downtown or to Midtown for your Chinese or Vietnamese fix (respectively); nowadays the new Chinatown (or sometimes "Asiatown" which locate on Bellaire Blvd. at Beltway 8) is the new one-stop shop for your cravings. Lying just north of I-10, Long Point Drive and North Gessner sport crowded Korean joints, fantastic taco trucks, and hidden Thai gems. With hometown stars such as Monica Pope (Sparrow Bar + Cookshop) and Bryan Caswell (Reef, Little Big's, El Real) making their debut on TV shows such as Top Chef and on the Food Network, and more and more chefs and restaurants getting name-checked in media (like GQ's Best Of lists, or Bon Appetit's recent declaration of Houston as the best food city in Texas) and earning award nominations (Randy Rucker's Bootsie's Heritage Cafe was up for the James Beard Award for Best New Restaurant - the "Oscars of the restaurant world"), Houston's dining scene seems slowly but surely to be staking out room on the national stage. Like any city with a respectable, trendy food scene, Houston's top restaurants seem to be all about what's seasonal and local these days (oh, and Houston is just now getting into gourmet food trucks), as well as becoming increasingly prominent in stores as well. Fresh produce to seek out include tomatoes, sweet "1015" onions (not as sweet as the Hawaiian variety, but pretty impressive), watermelon, strawberries, peaches, corn, carrots, and squash blossoms. Look for Texas cheese from the [Houston Dairymaids] and bread baked daily and shipped to restaurants from the Slow Dough Bakery. Houstonians are just as crazy for crawfish (no "crayfish" down here, Yankee) as Louisianans are, as well as catfish and Gulf seafood such as red snapper, blue crab, and shrimp; gaining in popularity are local species that were previously overlooked, such as blackfin tuna, tilefish, grouper, almaco jack, and black drum. Houston has always had a steady supply of oysters from Galveston Bay, but the program of oyster "appellations" has only recently been revived, meaning high-quality specimens are labeled with their reef of origin, just like the well-known varieties from the east and west coasts - look for varieties such as Ladies Pass and Pepper Grove. The Urban Harvest Farmers Market, also known as the Eastside market due to its location on Eastside Street in the River Oaks area is a great place to buy local produce and grab breakfast. The market has about 60 vendors ranging from small farms, ranchers, fishmongers, bakers, and chefs making breakfast. The market runs on Saturdays from 8am-12pm at 3000 Richmond Ave. The Saint Arnold Brewery , located in Houston, is billed as Texas' oldest microbrewery. Their brews are often sold in local bars. The brewery is open for public tours Monday through Friday from 3:00PM to 4:15PM, and Saturday 11:00AM to 2:00PM. In addition to, or in lieu of taking the tour, you can bring food and sit at the rows of picnic tables in the large beer hall. Admission includes four 8oz samples of beer. This unique admission setup exploits a loophole in state law that tries to prevent brewpubs from packaging and distributing beer. Houston has multiple telephone area codes and mandatory 10-digit dialing. For any number, even within your own area code, you need to dial areacode + number. For local calls, you do not dial a 1+ or a 0+ before the number. Some calls within Houston are considered long distance, and for those you need to dial 1 + areacode + number. Houston's area codes are: 713, 281, 832 and 346. Crime in Houston is high and the highest in the state, and has a reputation among Texans as a high crime city. Travelers to Houston should follow common safety procedures such as staying away from deserted areas after dark, keeping purses/wallets in a secure location, and putting valuables out-of-sight in parked vehicles. For emergency assistance, travelers can contact Houston Police Department by dialing 911. In addition, travelers should dial 911 to report most crimes in progress. For non-emergency assistance and for crimes not in progress such as minor assault, car theft, home invasion, property damage, and theft, dial 713-884-3131 and request police assistance. The Houston Police Department also allows citizens to file online reports for minor property damage and theft if they are under $5,000 in damages. Residents of Texas are allowed to carry concealed firearms after completing training and a thorough background check. Houston is like much of the Gulf Coast in that it is very vulnerable to hurricanes in the summer and fall. If a hurricane is forecast to make landfall anywhere near Houston, listen to officials and heed mandatory evacuation orders if one is ordered. The last major hurricane to hit Houston was Hurricane Harvey on August 26, 2017, which caused a lot of flooding and severe damage. Houston is very hot and humid in the summer with high temperatures of 90°F - 100°F (32°C - 38°C) pretty much every day from late May to late September. In the daytime, one may not be able to stay outdoors for very long without having to seek relief in air conditioning. However, in the winter, Houston can be mild with temperatures ranging from 30°F - 64°F (-1°C - 18°C), albeit with many cloudy or rainy days. Unlike other large cities in the nation such as Chicago, New York, San Francisco, Dallas, or Los Angeles, Houston doesn't really have a local rail rapid transit network in place. The existing light rail network for the most part is of limited use to visitors aside from the Red Line. That being said Houstonians have a tendency to park along the rail lines to go into downtown or the medical center as it is easier to get in and out of those areas with the train without the hassle of parking and traffic. Please be careful when coming near the METRO Rail track, especially at intersections. Follow the signs since the trains move very quickly and run at almost all hours of the day and night. It runs almost silently. At many streets, left turns are not permitted. Also watch the signs and signals, because some will change as trains approach. Do not drive on the tracks as there are large raised white domes that separate the roadway and the rail line. In some areas signs may indicate driving (or walking) on the tracks is permitted (currently only in the Texas Medical Center) but make sure it is safe to do so. Drive across the tracks only when you are sure it is safe to do so, especially at night as an oncoming train may not be heard by a driver inside a car. Houston Chronicle - The city's main newspaper which is read throughout the city and in the surrounding areas of Texas. La Voz - Houston's primary Spanish language newspaper. Houston Business Journal - Houston business news. Houston Press - An alternative, free weekly newspaper which focuses on lesser-known news as well as movies and local events ranging from current theatrical productions to concerts. Southern China Daily - Houston's primary Chinese language newspaper. Thuongmai Viet Nam - Houston's primary Vietnamese language newspaper. Houston Culturemap - An alternative, free weekly newspaper which focuses on lesser-known news as well as movies and local events ranging from current theatrical productions to concerts. Galveston— Only about an hour's drive southeast from the city, Houstonians go to Galveston island for its beaches, the Strand, Schlitterbahn Waterpark Galveston, and Moody Gardens. Surfside— Another beach, less crowded than Galveston. About an hour from Houston. New Braunfels (about 174 miles west of Houston) is famous for being the home of Schlitterbahn , which is a huge waterpark, rated #1 waterpark in America by the Travel Channel. Kemah— Nice boardwalk with great restaurants and amusement rides that is south of Houston and on the way to Galveston Island. Brenham— See the Texas countryside in Brenham and tour the Blue Bell creamery. About one hour (75 mi) north west of Houston along US 290. A Taste of Coastal Texas— An itinerary leading you through sights along the Texas Coast down to Corpus Christi. This page was last edited on 23 September 2018, at 10:26.